Wisdom of Life. : The right way to give your name cards. Name cards are important, especially when you are in business or in sales. The name card is your identity, representing your company and yourself. Now! 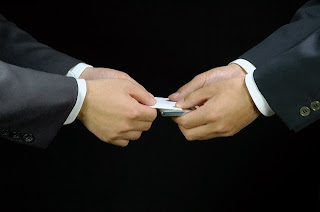 When you are out doing business, where do you keep those cards. For the ladies, they normally would be keeping them in their handbags. And for the gentlemen, do you keep few of these name cards inside your wallet? From my observation, most salesmen would handover their cards from the wallets which are always kept at their back pockets. Right? Men have their pants which are tailored with two handy pockets at their back. On the right is where they put their wallets, and on the left we normally have a handkerchief. To me, I never keep my name cards inside the wallet. Personally I feel is not a proper manner to give out name cards from your backside. It's rude and doesn't look appealing to the one who receives your identity. I always keep my name cards inside a small folder or pocket diary which I put inside my front shirt pocket. My cards would be given out from the front, almost like from the heart I give them out. Is more sincere and polite to give them from the heart. Plus give them out with a smile with two hands together. This gesture is the most effective way of giving out your identity, especially to those who might be meeting you the first time. I have been doing it ever since I was a salesman forty five years ago. I really works. Please try.